The Masters Of Warner Bros. Animation worked in a run-down back lot building known as ‘Termite Terrace’. talent of the directors, animators, voice talents, writers and musical direction of their production units. Bugs Bunny. Though he left the studio in 1942, his wacky attitude continued to be an inspiration to Warner Bros. animators for years to come. Pepe Le Pew, Marvin The Martian, Tweety, Sylvester, Yosemite Sam, and the Tasmanian Devil. Michigan J. Frog and Marvin The Martian. 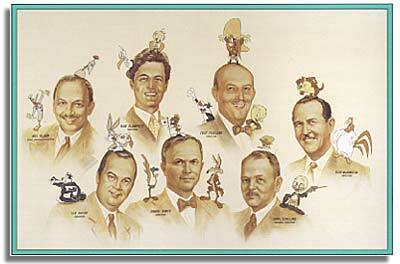 many of your favorite cartoons starring Bugs Bunny, Daffy Duck, Porky Pig, Speedy Gonzalez and Sylvester. perfectly fit the zany moods of the cartoons.